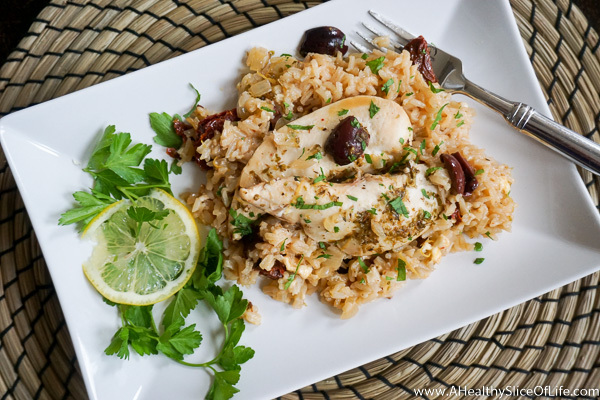 This One Pot Greek Chicken with Lemon Rice is a flavor-packed Mediterranean meal that cooks up easily and will delight the taste buds of all family members. Plus, only ONE POT to clean! So if you have read here for more than a minute, you’ve heard me talk endlessly about the Mediterranean parchment packs with salmon from our Whole Foods. The salmon in them is good, but the star of the show is the rice mixture. 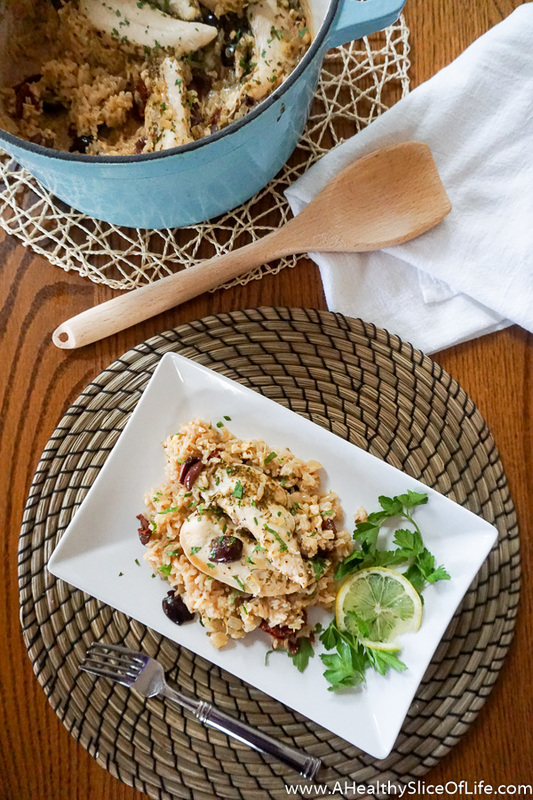 It’s packed with delicious goodies like feta and kalamata olives. It’s a dish I’ve tried recreating many times on my own, but never quite nailed it. Until now! This is a different spin on it, since it uses chicken instead of salmon (though you could sub it out by adjusting to less cooking time for the protein), but the rice mixture is spot on. The secret is in the lemon zest, so don’t leave it out. And the best part? It’s a ONE POT meal! ONE! 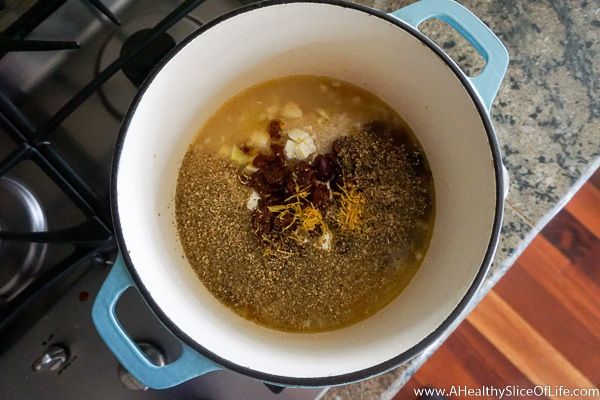 One simple pot to clean- oh happy day! And it’s super easy to clean too if you use an enamel lined dutch oven. Whatever you choose, it needs o be able to go from stove top to oven. The ingredients take about 20 minutes to prep, but don’t let that throw you, because it’s smooth sailing from there. 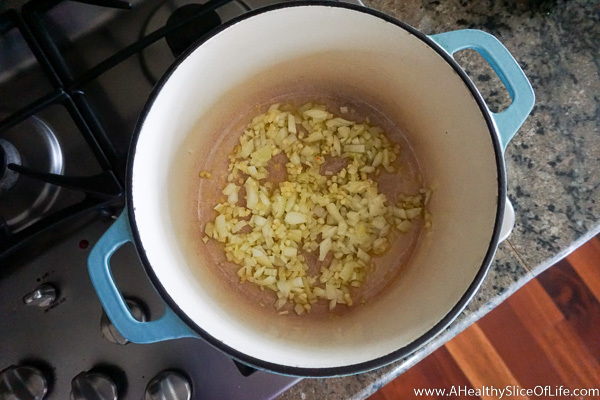 A little saute for the onion and garlic to ensure your kitchen smells incredible. Then, it’s an easy “add everything” and mix. The recipe below provides the details, but it’s beautifully simple and 30 minutes later, dinner is ready! I use chicken tenders because they are the easiest to quickly cut up for kids and I created this to be an easy family meal. Using bone-in chicken thighs would result in juicer meat, but again, this is how I make it for simplicity’s sake. She asked for her own bowl while I was snapping photos; she’s a fan. 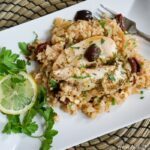 You also could omit the protein altogether and still cook up a fabulous pot of flavor-packed Greek rice as a base to some grilled salmon. That’d be amazing. Or just stick to the recipe as written, devour, and enjoy only cleaning that one pot! One final tip: check your local salad bar for the sundried tomatoes, feta, and kalamata olives. Instead of buying separate ingredients, you can snag a half cup of each for a fraction of the cost! Preheat the oven to 350 degrees. Chop all ingredients. In a large pot (I suggest adutch oven), heat the 1 Tbsp of olive oil over medium high. Add the onion and garlic and saute 2-3 minutes until onions start to become translucent. 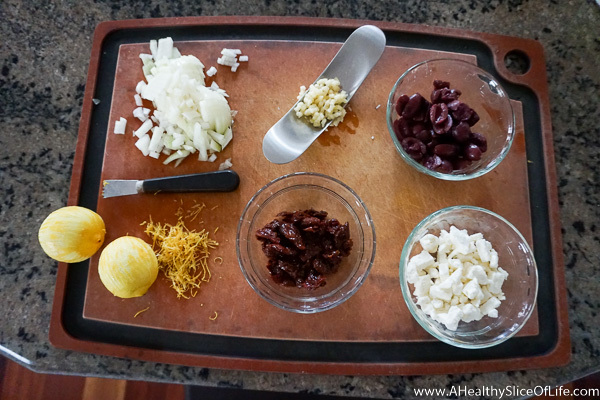 Into the same pot, add rice, broth, salt, lemon juice, lemon zest, oregano, feta, sun-dried tomatoes, and kalamata olives. Stir and bring to a boil. Once it reaches a boil, turn off the heat and add chicken to pot. Cover and place in oven. Bake for 30 minutes until chicken is cooked through and rice is fluffy. Plate and garnish with finely chopped parsley and any remaining lemon zest. This looks so good! I am ALL about one pot meals these days. I’ll add this to the list! Christina recently posted..Out of the Box Healthy Snacks: VitaTops for the Win! If it’s Greek, it’s good! John J. recently posted..Do NOT Share Your Romantic Partner’s Failings With Others! I wonder if this would work with brown rice? Or would the extra cooking time dry out the chicken? Sounds wonderful! I think it would work with brown rice, but if you are using chicken tenders, maybe wait and add them 20 minutes into the cooking time so they don’t dry out. If you try it, please let me know! This looks so good! 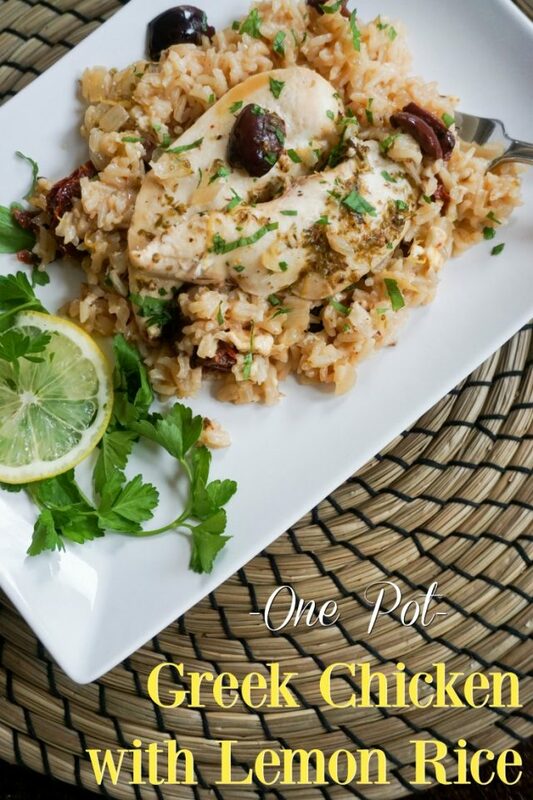 I live for one Pot meals! Just made this tonight and it was DELICIOUS! Also very easy to prepare. Will definitely add this to my rotation! Made this tonight, whole family loved it (from the 9 month old, to the 3.5 year old, to my husband and myself!). So easy, and lots of flavour! Thanks!! This looks so good, I want to try and make it. But I do not have a Dutch Oven Pot. Could I use another pot or dish? First time visitor here. But I already fell in love with what you have here! I have been following your blog for a few years now & I absolutely love it! I’ve never posted before but I’ve tried many of your other recipes & they have all been wonderful – this one did not disappoint either. It was delicious & my 5 yr old & 2.5 yr old loved it (of course so did my husband 🙂 ). Thanks so much for sharing! We made this for dinner yesterday and it was so good, definitely putting in the meal rotation! Thanks for the recipe! This is OUT OF THE PARK!!! Just made it for my crew (family of 5)…I wish it made more b/c it was SOOO good!!! I made this for our dinner tonight. As with all of Brittany’s recipes – it was a slam dunk. Brittany always has the BEST recipes. We have at least two recipes from her blog each week. Favorites include chicken tortilla soup, sweet potato chili, mom’s spaghetti sauce, Greek gyro burgers, just to name a few. Thanks for a new great one! Oh Kelley, thank you so much! 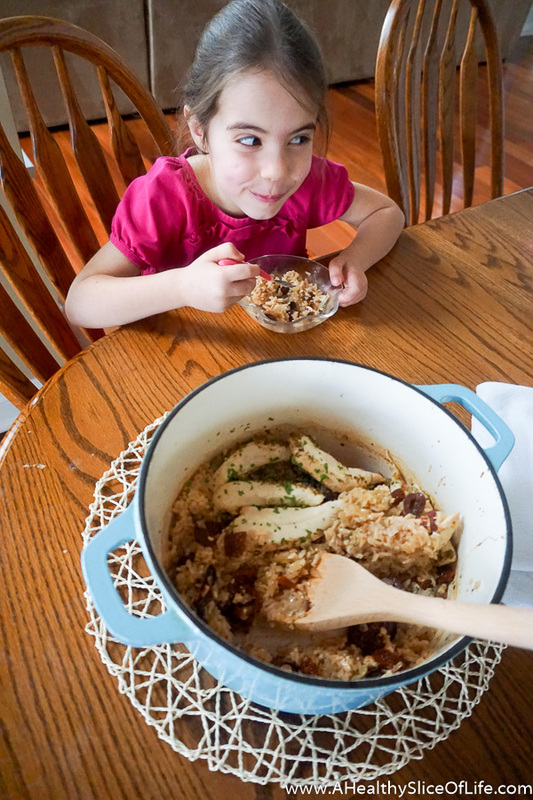 Hearing your family enjoys these recipes just makes my heart happy! We just made this dish in a cast iron skillet (we don’t have a Dutch oven) and it came our delicious!! Thank you!!! 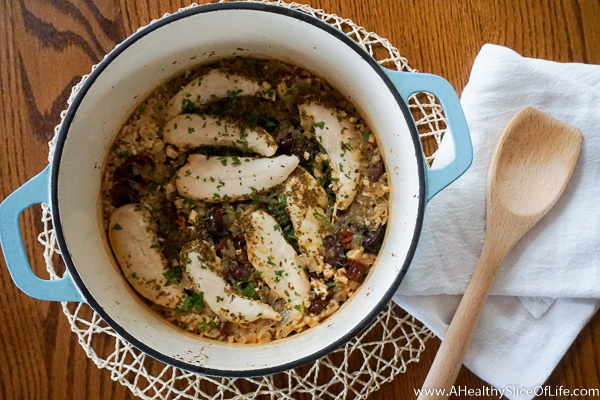 Hi Brittany – We made this for dinner tonight and loved the flavor! At the end of the 30 minute cooking time, the chicken breasts were ready (actually already dry), but the rice still needed a few minutes. What do you recommend I try next time? Oh no I hate to hear that! Did you use white long grain or brown? Brown will definitely take longer. If the chicken is dry, I recommend not adding the chicken to the mix until 10-15 minutes into the 30 minute total cooking time. Or you can make the rice on it’s own and grill the chicken separately (but I know that ruins the fun of the one pot clean up!). I hope this will help for next time! Thank you! I used white rice. Next time, I’ll try adding the chicken ten minutes into the cooking time.